That all of those little tasks could just be taken care of, and you didn’t need to worry about any of them any more. Well if that sounds like you, you’re in luck. If This Then That allows you to take lots of your daily tasks and automate them, for free. Making your life as a digital marketer much easier. So if you’re interested in having more time, the free tools in this article are for you! The tool uses Recipes (also known as Applets) to connect different apps and tools to create productive workflows. Think of them like a chain reaction; when you take an action in one tool, another happens in the tool that it’s linked to. This means you never have to repeat a repetitive task that you don’t want to. So, think of it like free outsourcing for the tasks you hate. If yes, activate it. If no then you can create your own recipe. The amount of Recipes you can create really is endless! Which are the best IFTTT recipes for you? Great Video Matt – Cheers! I love IFTTT too – I use it to help me know when bloggers I follow post :-) As you can see it works. Hahaha ^^ got any other creative ways you use it? Interesting – what services are you blending for that? That’s a pretty cool service, and it’s free. I may have to toy around with that to see how I can use it in my business. Awww man there are SO MANY uses for it! This is amazing. Fits perfectly with Profit Hacks stuff (if you’re familiar with that course). Owe you for this post Matthew! Brilliant tutorial, Matthew. I played around with IFTTT, but could never get a real handle on it, so I forgot about it. However, after your run throughs of how you use it, I’ve got some excellent ideas of how I can create my own recipes. Thank you — I’m off to get started with IFTTT again, now that I know what to do. I love me some IFTT, however I did lose a bit of interest when the Twitter sharing got messed up with API disappearing etc. That was only when using it as a ‘trigger’ though I think? Wow. I’m blown away. I don’t see how I haven’t heard of this before as a productivity geek! I don’t user evernote at the moment but I suppose I should probably have a look into it. MS OneNote ;) it’s much easier as I use it on Windows 8 as an app. Hey I do use IFTTT now! Ahh hadn’t heard of OneNote – does IFTTT support it? Unfortunately not, I might contact them and see what they think. Not sure if there’d be as much demand for it though. Nice post again. Thank you. Do you know if it possible to “concatenate” recipes? This is so awesome it’s mind-boggling. I must say – I have heard of this service more than once but never taken the time to understand it. You did a compelling job of dumbing it down us 90mph types. Matt you forgot to add the annotation within YT to be able to click on the videos. Or it could just be my iPad3 that will not allow it. I was just about to start using Google Reader to keep up with some blogs related to my niche + some other blogs only to find out Google Reader is being shut down in July. Are there any alternatives that will work with IFTTT? True, a lot can happen in a few months. Readability looks nice. Yeah it is one of the better ones I’ve seen – we’ll see what happens though! really great,,, you’re really kind guru..
Urgh Guru is a horrible world – I’m still learning! I’ve already setup Evernote following http://www.thesecretweapon.org/. Only bummer is that I’m on Snow Leopard Mac so there is really no easy way to follow along completely. But the organization method itself is fantastic. Once I combine with IFTTT i’m going to be 10x more productive! It is an amazing system – what problems are you facing with the Mac integration of this? Well you can’t integrate evernote with mac mail. There is a script online, but it only works w/ Mac Lion and above. I have Snow Leopard. But other than that it’s great! 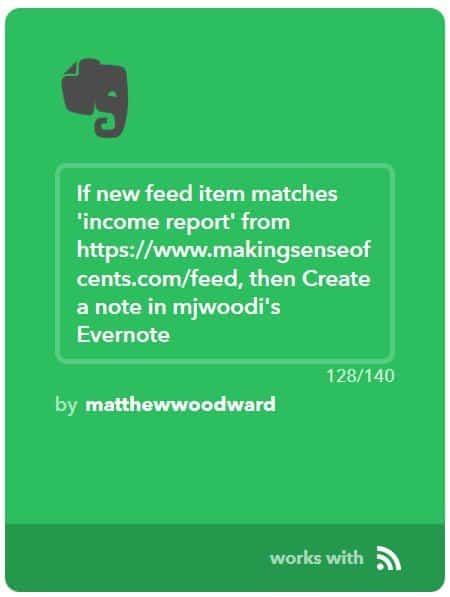 Just setup a recipe on IFTTT to put any link I post on FB into a notebook on Evernote. Awesome! I’m a huge evernote supporter and just found out about IFTTT. This video is perhaps the BEST example of what IFTTT can really do. Thanks for taking the time to put it together and post it. My imagination is running wild with ideas. Can you post the link to the TB specific add-on you are using please? I was trying to use IFTTT with my YouTune subscriptions. Want I want to do is if a new video is published then I want to add it to my Watch Later. I have the RSS feed of my new subscriptions videos, but can’t work out a way to get them onto the Watch Later list. Any ideas? Or perhaps there’s another way to create a playlist of these videos. I’d also love to be able to have the videos automatically removed from the Watch Later list if that is at all possible. Sorry I haven’t really used it with youtube. Have a look at https://ifttt.com/recipes?channel=youtube though? I just set up a whole fancy schmancy string of these for a couple other sites last night. Very funny that my opt-in with you was timed to send me an email about it this AM. :) Such a great tool! I’ll have to check out your recipes later today. By the way, I noticed that the links from your email campaign are not tagged. I recently learned that un-tagged links from referrals such as emails often lose the referrer in Analytics and end up being attributed to direct traffic. Therefore, you might not be able to calculate the real ROI/value of visitors from actual direct traffic vs referral traffic since it’s not truly segmented properly. I’d love to hear your thoughts on this! There are lots of cool uses for it though. Never heard of this tool until now. I do automate a lot of the tasks you mentioned but never in this way, and this is actually a much easier/simpler way than some of the other systems I’ve built up. I’m going to have a play with it now and see what else I can automate. Thanks man! P.S. I’m not sure why but I only just received an email about this post. I thought it was a new post until I looked at the date. Can you shed some light? Hope it helps you out Sandy! Can I do like this: Once I publish any new blog post on my blog it should automatically shared on FB, twitter and Google+? Now that you use Evernote, do you (still) use Google Calender? What is the best way to get everything in one place? Nice post Matthew :) are you use before syndication networks with IFTTT? Great tutorial (as usual), which RSS reader do you use these days now Google Reader is no more? Really useful post, I’m going to give IFTTTT a go. I struggle posting on a daily basis, as such I would rather schedule everything in one go. Thanks Matt and keep at it!!!! Been using this bad boy for years. Just running in the background for a list of Twitter/ Linkedin followers. Yeah great tool, and its free!! Just came across IFTTT a week ago. Looking for some natural branded backlinks to dilute my rich anchor text profile. Hoping I can get some juice too. What are your recommended web 2.0s? What an incredible IFTTT Recipes, well explained. The Strategies are quit different but really very very superub. Thank you for the awesome post. Thanks, Matthew! Great post! You do come up with some rare gems from time to time. And this post certainly qualifies. Thanks for sharing. Great post, Matthew. I really like the notification Applet for new blog posts so we can jump in and comment. I’ve already added this Applet to my list :) Thanks for the tip. I’ve been using IFTTT for a while and I totally agree that it is a massive time saver. I particularly like being able to post to other platforms to get that extra exposure. I have seen the Medium Applet before so Ill definitely be giving that a go. Amazing post, regards from Brazil. Really nice .. i think this will reduce my sharing time .. Great post again. keep it up. Great information. Do you ever have issues with IFTTT and WordPress? I setup applets and now get multiple posts of the same post on my blog and not sure where to start troubleshooting. Do you have some duplicate applets?